EaseUS has a few minor UI and configuration problems, but still offers up enough features to make up for what it lacks. 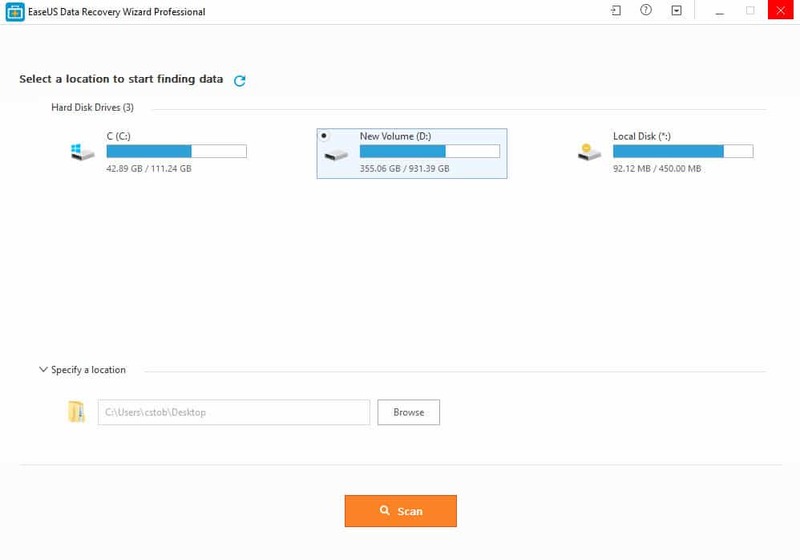 EaseUS Data Recovery Wizard Pro is a recovery suite that doesn’t waste time, getting users their data back quickly and efficiently with hardly any fuss. The minimalist design and lack of configuration options might be an issue for more advanced users, but for first-timers the simplicity of EaseUS Pro almost can’t be beat. It’s always good to have a clean design aesthetic, but, in the world of data recovery, results are really all that matter in the end. So how did the software stack up when we put the poker to the fire? Read on in our EaseUS Data Recovery Pro review to find out! From the time we punched the EaseUS URL into the address bar of our browser to getting it up, running and off on its first scan, we counted less than two minutes between all parts of the process. Once the data recovery was downloaded on our Windows 10 machine, activating the product was as simple as clicking the Activate Now button in the top-right corner of the client itself. In less than five seconds the product was unlocked with the full gamut of features, though as you’ll read on in our review the options to actually configure any of those features was limited at best. To call the design of the EaseUS Data Recovery client “minimal” might even be too much for most minimalists, because outside of the option to select which hard drive you want to scan there’s really not much else to talk about here. As soon as the product was activated, we were only given a chance to select a hard drive and hit the Scan button at the bottom – nothing else. We couldn’t select which type of scan we wanted to run, how deep we wanted the scan to be, or the specific file types we wanted the service to keep an eye out for while filtering out the rest. Many of the same search parameters that are available on most data recovery software suites are all lumped into a single scan category with EaseUS, something that may be frustrating for users who only have one specific file they’re trying to find and don’t have a ton of time to sort through other results to get it. EaseUS does have separate quick and deep scan options, but they’re always combined into one motion with the quick scan happening before the deep scan. You can’t run one independently of the other, which seems like a really strange limitation to put on any software let alone one that costs as much as this. The last feature that bears mentioning is the « Image Recognizer », which is a first for any data recovery software at this tier. The Recognizer will actually scan the content of an image to organize it into one of \three categories: People, Animals, or Buildings. The results we got back from the Recognizer were…mixed (at best), but the fact that EaseUS is trying something like this out at all says a lot about the small innovations the company is working on to make the process of recovering data more user friendly. To test data recovery capabilities of EaseUS, we stored (and deleted) five different file types ((*.exe, *.jpeg, *.mp3, *.zip, and *.txt) to see how it could recover data from an SSD, an HDD, and a USB flash drive. For the first test, I ran a basic scan on my 1TB Seagate 7200RPM to see what it could pull up. We recorded the length of how long the first scan took on our test system, which features a 7th-gen Intel Core i7-7700K 4.2GHz processor (overclocked to 5.1GHz on closed-loop liquid cooling), 16GB of DDR4-3000MHz RAM, a 256GB m.2 SSD, a 1TB HDD, and an NVIDIA GTX 1070 GPU. There was no noticeable impact on our system while we were running the deep scan, and at max EaseUS only used about 7% of our CPU, 15% of our RAM, and 108.4MB/s on the HDD being scanned. The deep scan we ran on a 1TB HDD took just over 2 hours and 13 minutes to complete, and returned 268,784 individual results after it was finished. Once the results were returned they were organized into three different categories: Lost Files, Special Lost Files, and RAW Lost Files. Where the file you’re looking for might end up depends on when it was deleted and how much data was lost, but as we mentioned earlier because of the lack of configuration options unfortunately there’s no way to dictate ahead of time how the program sorts these results once they’re displayed. Of all the files we deleted and tried to recover we saw a near 100% success rate with EaseUS, and we only say “near” 100% because there seemed to be a few pixelated artifacts in a corner of one of the images that was recompiled after the recovery. The first Pro option will run you back $69.95 for a lifetime license, while the Pro + WinPE variant costs $99. Adding WinPE to your package will give you the option to run a semi-full Windows environment straight from any USB stick. This can be helpful in situations where your data loss is so severe that you can’t even run the hard drive you’re trying to recover, and can also make it easier to run recovery operations on the go if you need to do some work on friend or family member’s PC. 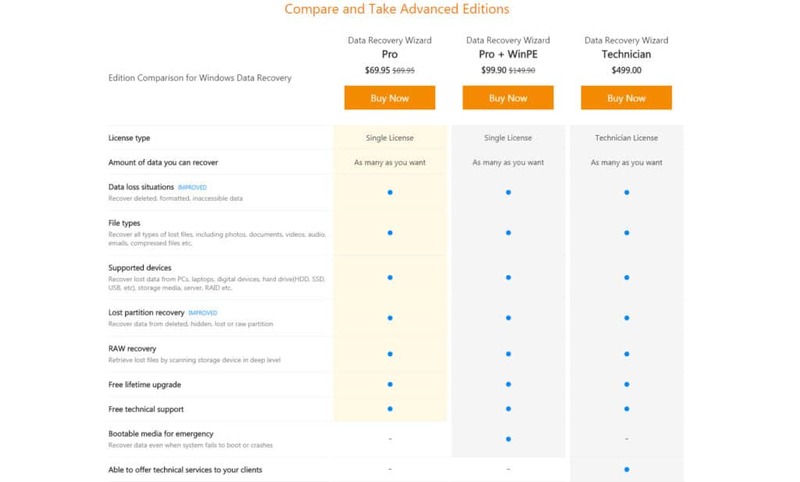 Finally there’s the Technician level subscription which is $499, but this should only be your pick if you run your business with the help of a data recovery suite and need a license that will allow you to legally offer the service to your clients without breaking any of the Terms of Service agreements. No matter which package you inevitably go with, EaseUS offers a 30-day no-risk money-back guarantee on all of its available products. 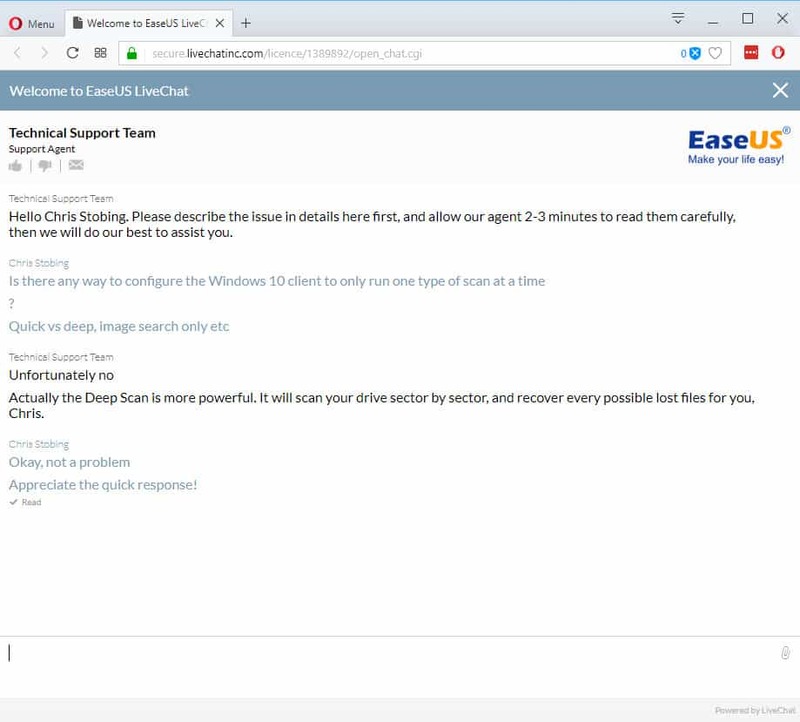 The support options available to EaseUS customers are one of the most extensive we’ve seen to date, including phone, email, and 24/7 live chat. It should be noted however that the level of support you have access to is gated behind the license tier you’ve purchased, with Technician users getting the most support options (including priority response times on email queries), while Pro users are second in line but still have access to the same network of support reps that Technician users get. Phone support keeps some odd hours for US customers, though. The support site says agents are available from 5PM to 6AM, and I’ve bolded those hours to emphasize the oddness of them. Sure this is helpful for anyone who only does data recovery after they get home from work, but for anyone who uses the Technician license locally it might be a huge hassle to only have agents on hand when you’re already getting ready for bed. The next option is the 8×5 Live Chat support, which runs from 9:00 to 17:30 UTC+8 Monday through Friday. We contacted live chat with a few simple questions along with some more technical queries, and the agent we spoke with was able to handle everything on their own in a quick and expedient manner. EaseUS Data Recovery Pro for Windows is a capable data recovery suite that aced nearly all of our performance tests, while leaving a very minimal impact on our system when the recovery process was running. Its design is a lot more minimal than we’re used to and there could absolutely be more configuration options to tinker around with before you run a scan, but thanks to its stellar customer support and extra features like image previews and Image Recognizer, we still think EaseUS is worth the cost of entry despite some of its more obvious shortcomings.